The break dance ride is a thrill attraction amusement ride for all family designed in 1985, now it has been a successful ride for carnivals, parks, fairground and family entertainment centers. 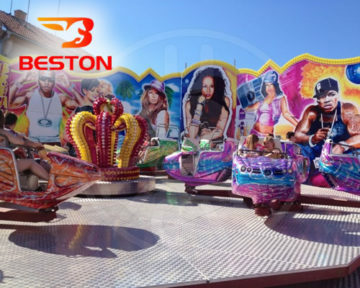 As a professional amusement rides manufactrer, Beston is the leading breakdance ride supplier in China. Three items break dance for sale with competitive price for you, it also called “rotary magic gyroscope”. if you like, the ride on trailer is also available. Breakdance consists of a dodecagonal platform with a diameter of 20 meters, upon which are mounted four hubs, each bearing four two-person cars. The entire ride is on an incline of 7.5°. When the ride is activated, the platform rotates, the hubs rotate in the opposite direction to the platform. The combination of the platform slope, hub movement, and weight displacement within the cars cause them to rock back and forth, the oblique join mount and the motion of the ride allowing the cars to rotate through 360°. Beston breakdances incorporate backdrops, and the provision for sound systems, elaborate light displays, and special effects equipment is made. Controls for these additional systems can easily be routed through the operator’s console. Traveling versions of this ride can be disassembled and stowed on two 40 ft trailers, one for the ride itself, the other carrying the platforms, backdrop, special effects equipment and ticket box. The color and patterns are all can be customized by your inquiry. If you are looking for a quality Breakdance amusement ride, Beston is your ideal supplier. Just send an e-mail or leave a message to get the price and more details.